It's a Tank. One called the "Kodiak," and is a superheavy weapons platform produced by the Great Belnesarian Empire over a century ago. The only reason it's still in service today is because it's cheaper to make than a proper Skyship, and is roughly as durable as a fully-shielded frigate. Compared to tanks in the real world, though, it looks plainly ludicrous. 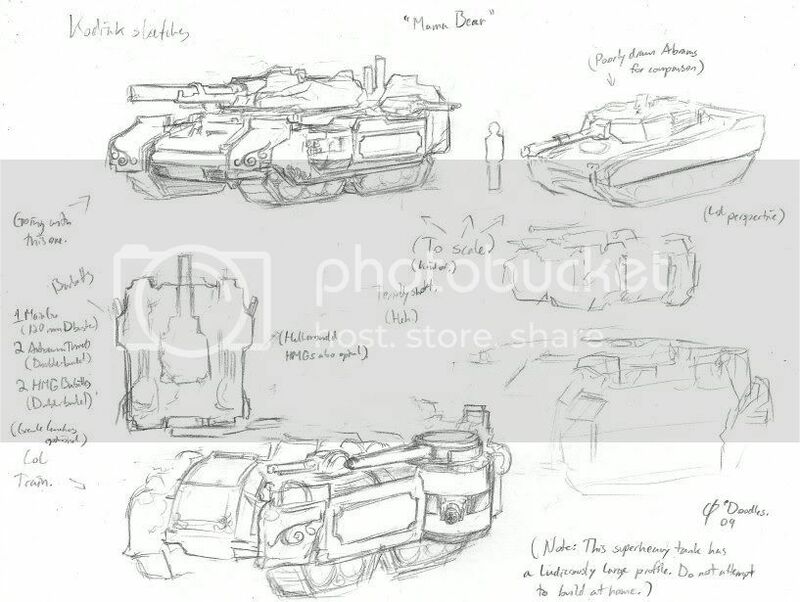 As you can see, by the inclusion of secondary turrets and barbette guns ("sponsons," if you will), the Kodiak is in fact a rip off of a certain type of superheavy tank from a certain miniatures wargame whose particular owners are usually quite jumpy about copyright. However, I don't think they've trademarked the concept of "silly tank the size of a house." The original tank this one was designed to resemble is actually very distinctive in appearance compared to the Kodiak; mine is an oversized ordinary tank with a few extra gubbins added. Including Victorian scrollwork. There's no reason to put scrollwork on a tank's armor, and every reason not to, which is precisely why I did it. I'll probably change mine to look less generic and more weird so as not to get any cease-and-desist letters. And unlike AFs, heavy vehicles can be fitted with high-integrity shield generators. AFs usually use up most of their space for locomotive systems, pilot support, and ammo. As non-walker vehicles rely on simpler methods of self-propulsion, they save up a lot of room for extra defensive or offensive measures that AFs can't carry. Superheavy tanks, in particular, are known to carry shields rivaling that of spacecraft several times their size. The Kodiak superheavy tank happens to be the toughest of this class of war machine. This Kodiak, the sketch in the upper left, I call "Mama Bear." That's a good a name for a tank as any. The only thing that comes to mind here is that awful joke used by the genie in Aladdin and the King of Thieves. Let's say you get one of these giant tanks with super-awesome shields. And then you fire it outta cannon, like a cannonball. ... I don't have a follow-up, so I'll leave it there. They call that sort of maneuver an "aggressive airdrop."